The author, journalist, television commentator, and longtime Washington insider reflects on the spiritual quest that has brought deeper meaning to her life—and kept her grounded within the high-powered political world of Washington, D.C.'s elite—her renowned writing career, her celebrity marriage, and her legendary role as doyenne of the capital's social scene. While working as a reporter, caring for a learning-disabled son with her husband, longtime Washington Post executive editor Benjamin Bradlee, reigning over the capital's social scene, and remaining intimately connected with national politics, Sally Quinn yearned to understand what truly made the world—and her life—tick. After years of searching, most of which occurring in the secular capital of the world, she came to realize that the time she spent with friends and family—the evenings of shared hospitality and intimate fellowship—provided spiritual nourishment and that this theme has been woven into all the most important moments of her life. 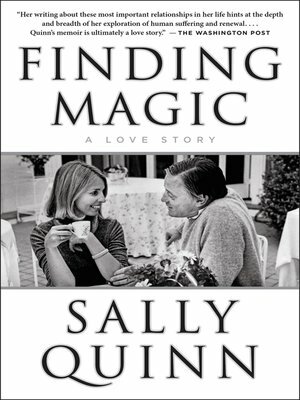 In this spiritual memoir, Quinn speaks frankly about her varied, provocative spiritual experiences—from her Southern family of Presbyterians and psychics, to voodoo lessons from her Baptist nanny, her trials as a hospitalized military kid in Japan as the Korean War begins, to her adventures as a Post reporter and columnist and her experience as one of the first female news anchors on national television; her battles with the Nixon administration, Watergate, and other scandals that have rocked the nation; her courtship and long marriage to one of the most authoritative figures in the media; her role as the capital's most influential hostess; and her growing fascination with religious issues. This fascination led to her pioneering work in creating the most visited religious site on the web, OnFaith.co, where she reports on the unseen driving force of American life. Throughout this radiant, thoughtful, and surprisingly intimate memoir, Quinn reveals how "it's all magic"—the many forms of what draws us together and provides meaning to all we do. Her roller coaster and irreverent but surprisingly spiritual story allows us to see how the infinite wonder of God and the values of meaningful conversation, experience, and community are available to us all.